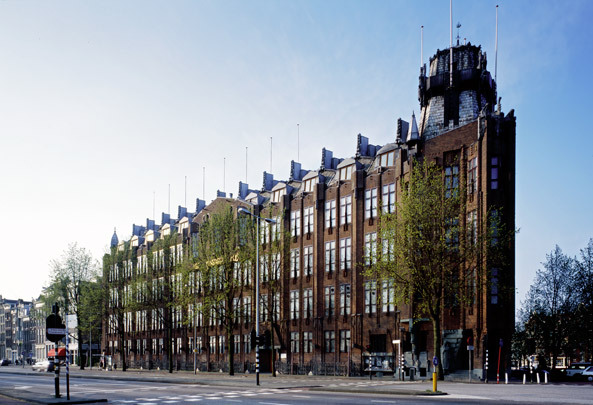 Once the office premises of six shipping companies, this is generally considered the first building to be realized exclusively in Amsterdam School style, also thanks to De Klerk and Kramer, at that time both working at Van der Mey's office. The decoration at the fantastically sculpted entrance gives this corner a strong vertical thrust. The building's crowning achievement spatially is its geometrically ornamented central well. After the last shipping company vacated the building in 1981 it was taken over by the City of Amsterdam. Since 2008 the building is in use as a hotel.